Bariatric (weight loss) surgeries have become the treatment of choice for obese individuals who have failed to respond to medical management. The operation can either be restrictive or malabsorptive or both. Most bariatric surgeries involve the reduction of the stomach size either by resecting about 80-90% of it (gastric sleeve) or by creating a pouch (LAP banding, BPD). This restrictive part of the surgery limits the food intake of the individual by causing the sensation of fullness (satiety) following the ingestion of small amount of meal. It also reduces the production of the hormone ghrelin, an appetite-inducing hormone. The optimum goal of bariatric (weight loss) surgery is to achieve a significant reduction in weight following the surgery. Another benefit is to cause resolution of comorbid conditions that may be present. Although emphasis should be laid on the fact that bariatric surgery alone will not lead to a significant weight reduction if not complemented by dietary and lifestyle changes, nevertheless, some people may not experience adequate weight loss or may lose weight initially only to regain it later despite adherence to the nutritional plan. Some patients also end up stretching their stomach due to poor feeding habits. The inner stomach lining (mucosa) is thrown into folds. This allows for stretching following excessive eating. It is said that when one persistently eat excessively, the fold stretches out and never returns to its original size. This means you only feel the sense of fullness after you have taken an abnormally large amount of food. Pouch resetting is one of the several options available for those who are not losing weight as expected or who regained their weight following gastric sleeve. When compared to revision surgeries, pouch resetting is non-invasive, safe, cheap, and easy to carry out. 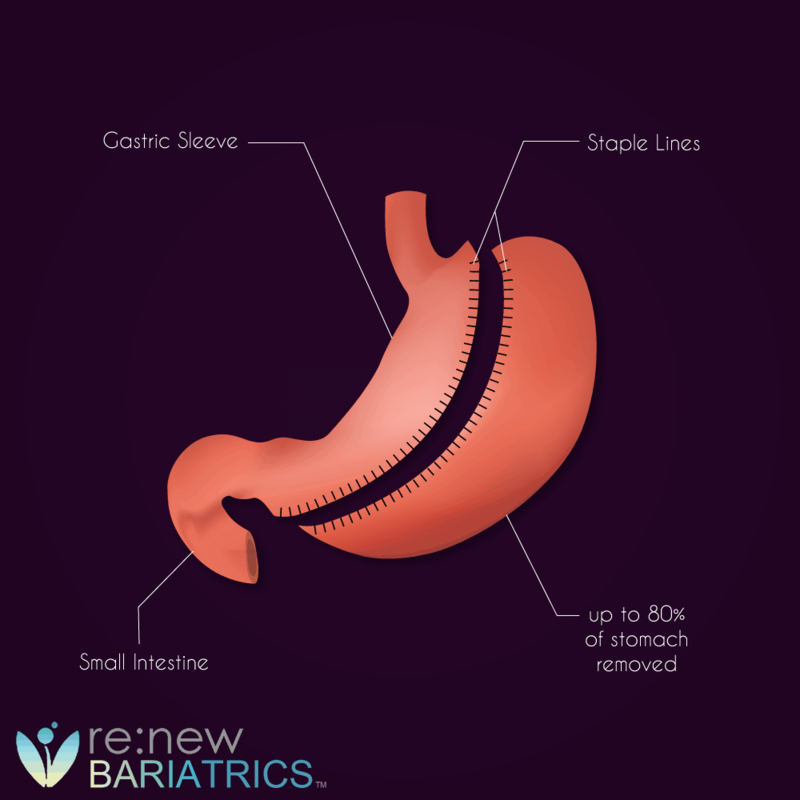 A pouch resetting is a way of returning your stomach to the size it was immediately after gastric sleeve surgery. Some believe that the stomach once stretched cannot return to its post-surgery state, however, whether the stomach returns to post-surgery state or near post-surgery state, the optimum goal of pouch resetting is to achieve a significant weight reduction irrespective of the degree of reduction of stomach size. Before embarking on pouch resetting, it is important to notify your doctor and dietician and work closely with them to achieve a successful outcome. In pouch reset, you try to change your diet to mimic the post-operative diet. The rationale behind this practice is that the post-operative diet will put less pressure on the stomach and allows for a reduction in size. Are You a Candidate for a Re-Sleeve, or Mini Gastric Bypass? If you’re wondering what are your options with poor weight-loss after gastric sleeve. Fill this form below, and we’ll forward it to our doctors in Mexico. We’ll go over their recommendations with you quickly. This resetting period usually lasts for about ten days. On the 1st day, you take only clear liquid diet such as water, broth, tea, coffee sugar-free non-carbonated drink. On the 2nd and 3rd day, you take full liquid diets such as protein powder with a sugar-free clear liquid, pudding without sugar, soup with soft noodles, non-fat containing yogurt, and sugar-free non-fat ice cream. On the 4th and 5th day, your diet should be mainly pureed foods. Examples are almond milk, coconut milk, soft cereals, soups, and scrambled eggs. By the 7th-9th day, you begin to take soft diets such as soft vegetables, soft cereals, soft cheeses, ground beef, soups, scrambled eggs. Others include Mashed fruit (bananas) and canned fruit (with low sugar content). The above drinks must be taken in small quantity at a time as the excess of them can also overstretch the stomach and prevents the aim of the pouch reset from be achieved. Eat small quantity of food at a time and immediately stop eating once you start feeling the sense of fullness. Eat slowly and chew thoroughly. Eating too fast allows you swallow gas which can contribute to gastric stretch. Do not drink water/liquid immediately after food. You either drink 30mins before meal or 30mins after a meal. Pouch reset is practiced by those who have failed to lose significant weight, following bariatric surgery or those who regained weight after initial losses. This occurs due to a stretched stomach from excessive food intake. Advice from your doctor and dietician as regard your fitness for this intervention is essential to achieve a satisfactory outcome. Are You a Candidate for a Re-Sleeve, or Mini Gastric Bypass? We’ll go over our top bariatric surgeon recommendations with you quickly.